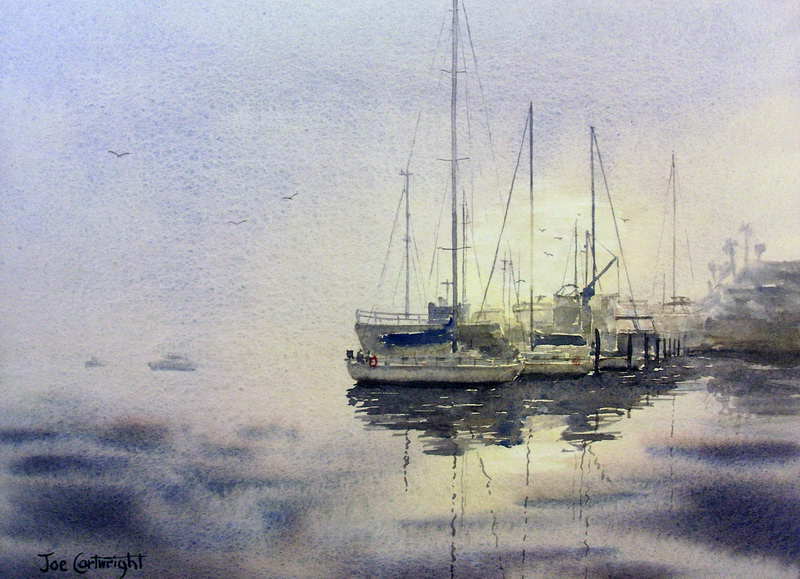 What is watercolor painting? If you tackle the subject from the point of view of painting with colored water, rather than watercolor paint you may find it easier to understand. By considering watercolor painting as dealing with colored water you are forced to give more thought to the water component. Water is the most important ingredient in watercolor painting but it is rarely given much attention. It is the water that lets watercolor paint do its magic. I have found that most of the difficulties new watercolor artists run into are related to not keeping an eye on what the water is doing. On their painting surface or in their palette or on their brushes. Sure part of the problem is confusion about what steps to take with their painting, however as this confusion slows down their response to their work which allows the surface to dry too fast – hence water becomes a problem even here. It is the flowing of water and pigment on your paper that leaves behind a nice clean layer of paint called a “watercolor wash”. If you do not use enough water in your paint mix it will not flow down or over your watercolor paper and you will have a rough looking paint layer. In fact this is often what people refer to as a muddy watercolor painting. It is muddy not because it is the color of mud but because the layer of watercolor paint on the surface of your painting is actually quite rough instead of smooth which is what happens when enough water is used in the mix. This rough surface seems to inhibit the transfer of light through the watercolor layer. If you run your fingertips over a muddy passage in your painting you will find that it feels rougher, than when compared to a nice clean passage of your watercolor painting. Think of sand on a beach. If the sand is roughed up by people walking, digging, or otherwise playing on it while it is damp, it will remain roughed up. However if a wave rolls over the sand as it washes back out to sea it leaves behind a nice smooth surface. This is similar to what happens on the surface of your watercolor paper. A definition of watercolor mud was given by a famous Australian watercolor artist, Norman Lindsay, who compared the process to that of a muddy puddle. If you leave a muddy puddle undisturbed, as it dries, it will leave a nice smooth finish. If however you disturb the mud while it is still damp, for example by digging into it with a stick, it will dry with a rough surface. This again is very similar to what happens on the surface of a watercolor painting if you keep trying to paint with thicker paint on a barely damp surface. The angle of your supporting board. The steeper the angle the less water is needed to allow the paint to flow. How fast you paint. This is connected to your skill and experience level. The slower you paint the wetter your watercolor paint mix should be so it doesn’t dry too fast and stop flowing. How wet your watercolor painting is from a previous wash. Painting with thick paint into an already wet surface will still give you a soft edge but it will be more controlled than when you paint in a wet surface with a very wet mixture. The tone (relative lightness or darkness) you are trying to create with a particular mix requires more (lighter tone) or less (darker tone) water. The type of edge effect you are trying to create. A very soft effect where it is not possible to tell when one color finishes and another starts needs more water than an edge which is more definite. The other extreme is where you want hard, definite, edges. In this case you would paint on dry paper – though the mix still has to be wet enough that it will flow. The size of the shape you are painting. A bigger shape requires more water in your mix so it does not dry between each successive horizontal brush stroke as you paint down your sheet of watercolor paper. Atmospheric factors need to be taken into account as well. If you are painting in a hot room or environment you will need more water than when painting in a cold one. Outdoors you have to make similar allowances for the wind, which can be really tricky – so much so I rarely try and paint plein air if the wind is too strong. Finally all of the above are inter-related – this is where the skill comes in! So next time you get out your watercolor painting gear give yourself some time to look at what the water is doing as you paint. It will certainly improve your results! Hopefully the above will give you a new insight into watercolor painting which will help you gain more from your art. Watercolor painting is a wonderful medium and I wish you many years of pleasure from it if you are just starting out. Should you have any questions of comments please do not hesitate to leave them in the comments section below.